KUSA – In the end, offense doesn’t win. Not usually. It’s a shame, really. The best game in the NFL this season? The Los Angeles Rams 54, Kansas City Chiefs 51, on Monday night in week 11. The worst game in the NFL this season? The New England Patriots 13, Rams 3, in Super Bowl LIII last Sunday. If not the worst, it was at least the most disappointing. Booorrr-ing. We shouldn’t have been surprised. There have been eight Super Bowls in which the No. 1-ranked offensive team took on the No. 1 defensive team. Defense has gone 7-1. The matchup in last week’s Super Bowl wasn’t quite as extreme. But the Rams were the No. 2 offense with 421 yards and 33 points per game. The Pats had the No. 7 scoring defense by allowing 20.3 points per game. The Rams weren’t ready. Not on offense, they weren’t. The ineffectiveness of Todd Gurley, Jared Goff -- and even Tom Brady from the winning side -- helped make LIII one of the worst Super Bowls of all time. But hardly the worst. Who are football fans in the Denver-area to cast aspersions? The Broncos didn’t just have the league’s No. 1 offense. The 2013 Broncos remain the No. 1 offensive team of all time. Peyton Manning, with Adam Gase as his offensive coordinator, threw a record 55 touchdowns for 5,477 yards while guiding the Broncos to 606 points (37.9 points per game). That Holy Trinity of offensive records stands a full 5 years later. Yet, on the first play of the Super Bowl, the Broncos hiked the ball into the end zone and the league’s No. 1 defensive team, the Seattle Seahawks, had a 2-0 gift. The first play was the game’s turning point, to show how bad this Super Bowl was. There had been six exciting, highly competitive Super Bowls in a row until XLVIII. This had the hype of the first-ever Super Bowl hosted by New York. Yet, it was 29-0 by the time Percy Harvin returned Matt Prater’s second-half kickoff and 36-0 before the Broncos scored on the final play of the third quarter. Wouldn’t you know it, the exception to the defense rule. The Broncos and defensive coordinator Wade Phillips had the No. 1 ranked defense in 1989. The 49ers and Joe Montana had the No. 1 offense. This was the fourth consecutive Super Bowl blowout loss (17 points or more) suffered by the Broncos, and third in four years. In their previous Super Bowl two years earlier, the Broncos had been blown out 42-10 by Washington. Back-to-back Super Bowl losses by a combined 97-20. Quarterback John Elway was a combined 24 of 64 passing with one touchdown against five interceptions and was sacked nine times in those two Super Bowl blowout defeats. No wonder Elway’s mom was less than excited when her son’s Broncos went back to the Super Bowl to cap the 1997 season (although this time, the Broncos pulled off an upset win against Green Bay). This route by the 49ers was the depressing culmination of the Broncos getting repeatedly humiliated on a national stage. With 31 seconds left and trailing 32-7 to the Raiders in Super Bowl 11, Vikings backup quarterback Bobby Lee threw a garbage time touchdown pass. Otherwise, the Vikings would have scored 7 points or less in each of their four Super Bowl losses over a seven-year span. In Super Bowl 4, Joe Kapp’s Vikings were 13-point favorites against the Chiefs. They were down 16-0 late in the third quarter. In Super Bowl 8, Fran Tarkenton’s Vikes were down 24-0 to start the fourth quarter as the Dolphins went on to win back-to-back titles. In Super Bowl 9, the Vikes were down 9-0 early in the fourth quarter when they scored off a blocked punt. And they were trailing 19-0 until the final minute of the third quarter against John Madden’s Raiders in Super Bowl 11. That’s right: 4 Super Bowls, 0 first-half points for Bud Grant’s team. For their penance, the Vikings have now gone 44 years without a Super Bowl appearance. The Bills went one better than the Vikings by losing their four Super Bowls in four consecutive years. This was No. 3 in their four-Bowl debacle. Bills quarterback Jim Kelly was awful – he fumbled off a sack and the Cowboys recovered for a touchdown. He threw two interceptions – one on fourth-and-goal from the Cowboys’ 1. And then he was knocked out of the game midway through the second quarter. Kelley and backup Frank Reich combined for 4 interceptions and four of the team’s six fumbles. And it could have been worse as Bills’ receiver Don Beebe whacked the ball out of the hand of Leon Lett as the Cowboys’ showboating defensive end was approaching the goal line of his long fumble return late in the game. This game was so terrible, a defensive player from the losing team – Chuck Howley – was the Super Bowl MVP. Howley did have two interceptions. The Cowboys were up 6-0 when Colts’ quarterback Johnny Unitas threw a pass that was tipped by one of his receivers, then tipped by Cowboys’ defensive back Mel Renfro before it hit tight end John Mackey in stride for a 75-yard touchdown. 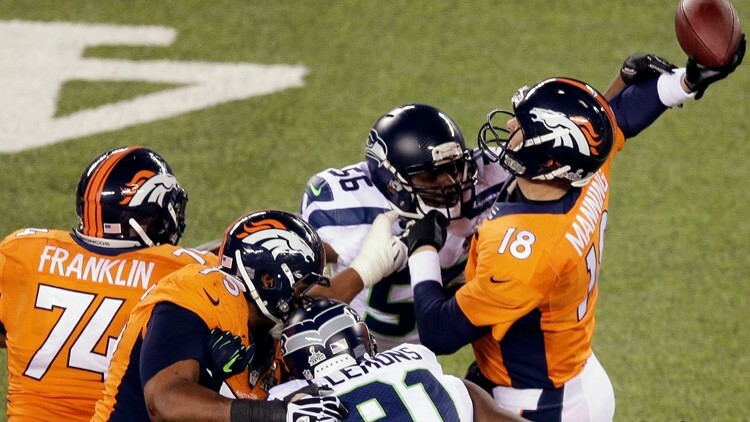 This was the worst played game in Super Bowl history. There were six interceptions thrown – three by Dallas’ Craig Morton, two by Unitas and one by Colts’ backup QB Earl Morrall – and six fumbles – five by the Colts, who lost four. Each team fumbled the ball away at the opponents’ 1-yard line – each time as it appeared the ball carrier was going in for a touchdown. That’s 11 turnovers, seven by the winning Colts. Baltimore kicker Jim O’Brien had a 10-yard extra point blocked and missed a 52-yard field goal but made the 32-yard game-winner with 5 seconds left. Competitive but a Super Bowl has never been more poorly played. This game was so terrible, two defensive players – Harvey Martin and Randy White – shared the Super Bowl MVP honor. At least they were on the winning team. It remains the only time there were co-MVPs. This was the first of five demoralizing Super Bowls blowouts endured by Broncomania. Morton was the Broncos’ quarterback in this one. Against his former team, Morton was 4 of 15 for 39 yards with 4 interceptions for a 0.0 passer rating in what is widely considered the worst quarterback performance in Super Bowl history. Backup quarterback Norris Weese engineered the Broncos’ only touchdown drive late in the third quarter. The Dolphins would finish a perfect 17-0 in their next season of 1972, and would win it all again in 1973. But they weren’t quite ready to compete with a Cowboys’ team that had Roger Staubach back from their previous year’s NFC champion team. The signature play of this game was the Cowboys’ Bob Lilly chasing down Dolphins’ quarterback Bob Griese for a 29-yard sack to end the first quarter. After the game, Cowboys’ star running back Duane Thomas ended his media ban by answering “evidently” to Tom Brookshier’s first question: Are you that fast, are you that quick? It started well. On the Broncos’ first offensive play, Elway threw a 56-yard touchdown pass to Ricky Nattiel. On their second possession, a 23-yard pass from halfback Steve Sewell to John Elway set up a first down at the Washington 13. And then the Broncos fell apart. They settled for a short field goal from Rich Karlis for a 10-0 lead to finish their second possession. But then Broncos safety Tony Lilly was among the defenders torched repeatedly for big plays in the second quarter as Washington scored 35 points in the quarter. Quarterback Doug Williams hit Ricky Sanders for touchdowns of 80 and 50 yards and somebody named Timmy Smith had a 58-yard scoring run, all in the second quarter onslaught. Smith rushed for 204 yards on 22 carries. After this game, Smith had six more carries for six more yards in his NFL career. This is how the first eight possessions, which took them midway through the third quarter, ended for Sean McVay’s mighty Rams and their 33 points per game average: Punt, punt, punt, punt, punt, punt, punt, punt. Total yardage: 72. This is how the first 10 possessions, which took them into the fourth quarter, ended for Tom Brady and the Patriots: Interception, missed field goal, punt, field goal, punt, downs, end of half, punt, punt, punt. It was 3-3 with less than 10 minutes left in the game. The Belichick Bore Bowl. The Rams had their chances, but Goff was either not ready for the big stage or no match for the defensive genius that is New England head coach Bill Belichick. Brady finished with two long scoring drives to win his sixth Super Bowl in 17 seasons as the Patriots’ starting quarterback (not including 2008, which he missed all but one quarter because of injury). The second 9 worst Super Bowls in chronological order: 9 (Raiders 38, Washington 9), 19 (Montana 38, Marino 16), 20 (Bears 46, Patriots 10), 28 (Cowboys 30, Bills 13), 29 (49ers 49, Chargers 26), 35 (Ravens 34, Giants 7), 37 (Bucs 48, Raiders 21), 41 (Colts 29, Bears 17), 50 (Broncos 24, Panthers 10).